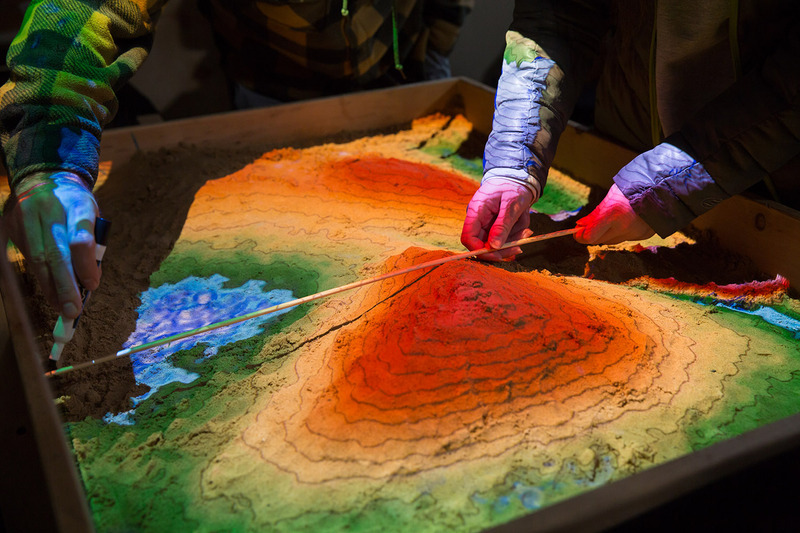 (VIDEO) The technology is being applied to a sandbox that allows students to visualize how manipulating the land affects topography. With the wave of her hand, Melissa Currie can make it rain. No, the assistant professor in the Department of Landscape Architecture in the College of Agricultural Sciences & Natural Resources can't control the weather, at least not in the reality most people know. But thanks to an instructional tool that combines a computer program and a sandbox, she can make it rain in augmented reality (AR). Students in the Department of Landscape Architecture measure topography levels using the augmented reality sandbox. That teaching tool, an AR sandbox, has become a vital and popular tool for Currie's site engineering class. It allows students to visualize what happens to the topography of a certain section of land during construction, giving them the ability to visualize their product in a three-dimensional model. "This is a challenging thing when students are transitioning from designing in two dimensions to designing in three dimensions, where you have to take into account landform," Currie said. "We wanted to use this tool to help them visualize what the contours look like and what the topography looks like, how you can change the topography when you're building something and what happens when you add water to the site in a more hands-on way, and how they can design in three dimensions." The new tool has become quite popular. Housed in the Landscape Architecture studio in the Agricultural Pavilion, the AR sandbox is being used around the clock by students not only working on site engineering, but also is open to other landscape architecture students who might be able to use the technology for whatever project they are working on. "Our studio is open 24/7, so anytime we have a project we're working on, we can come in here, use it and be hands-on," said Justin Palacios, a second-year graduate student in landscape architecture. "It really has been a great addition to the department. Being able to come here and use the sandbox has helped me understand the way the ground works and how watersheds are used, topography lines and being able to use that back in my drawings and in the creative process." Landscape architecture students in the past have relied on two-dimensional drawings to visualize how the landscape and elevations change with the addition of construction on the site. But that sometimes leaves open the possibility that things won't always look the same on the actual site as they do on paper. 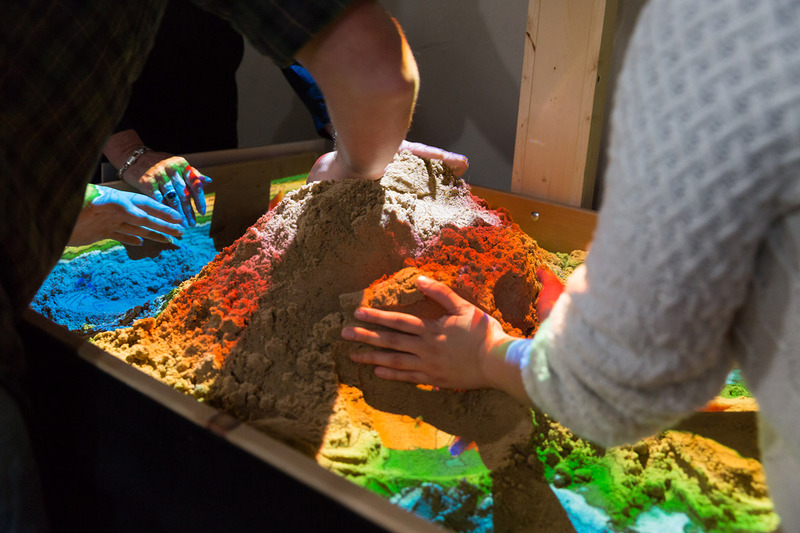 Students in the Department of Landscape Archtecture build a mound in the augmented reality sandbox in order to demonstrate higher topography levels. The AR sandbox can help take out some of that guesswork and does so in a fun, imaginative way that draws students in and makes them want to use it more, for any project they can. "We've been able to see site plans, which is pretty hard when you are drawing them out, with those details," Palacios said. "Having this application here is great because you get to see what you are designing before you draw it, and are interacting with it and seeing the topography with the ground. Being able to use your hands to do this is fantastic. You're actually getting to manipulate the ground." Constructed by Currie and her husband, Neal, the sandbox follows a concept first developed at the University of California-Davis and measures only a few feet square and about a foot deep filled with normal sand. Above the sandbox is a projector connected to a computer programmed to display elevation contour lines over the entire surface area of the sandbox. A contour is an imaginary line on a map that has the same elevation all along that line. As the elevation of an area of land increases, more lines are added to show the different levels of elevation. For the AR sandbox, the computer program interpolates the contour lines across the surface of the sand. When the sand is flat and even, there is no color, only the lines, representing sea level. But when the user manipulates the sand to create either a mound representing higher elevation, or a valley representing lower elevation, the topographical lines move closer together as the land gets steeper and color is added – red and brown for higher elevations and shades of green for lower elevations. Then comes the fun part. When the user holds their hand under the projector over a certain part of the sandbox, suddenly the sand turns blue, representing rain falling on that particular area. If someone has taken their finger to create a trench or other form of lower elevation, the water can then be seen running into that lower elevation, displaying how water would flow over that area. Currie said one of the more difficult concepts for students to design and understand is storm water management – visualizing grading and drainage in order to divert water away from structures using a diversionary swale, a shallow channel with sloping sides to move water around. The AR sandbox helps greatly in visualizing that concept. "This is one of the hardest things for students to calculate, what the contours look like running down the side of the swale, but also what they look like across the bottom of the swale," Currie said. "There are a lot of moving parts in trying to explain that and for students to try to graphically depict it in a plan. The sandbox helps because they can actually see those contours on that particular landform." The program also can help students transfer what they see in three dimensions in the sandbox back to a platform or map. When the student has manipulated the land to his liking, the computer can then freeze what is displayed on the sand so when a solid surface, such as a board or piece of cardboard, is placed over the top, the contour lines will be projected on that surface just as they would be on a map. "Sometimes when you're drawing it out, you can do it and it will look completely different, and you're like, 'I swear I drew it like this, why does it not relate to that?'" Palacios said. "Over here, being able to use this 3-D space, you can see where the lines are supposed to hit and get an accurate reading instead of getting out your scale bar and your ruler and trying to figure it out. Here, you can actually see it at scale and see how the topographical lines hit." And therein lies the whole reason for creating and using the device, in Currie's mind. Every teacher looks for it, that exact time when their instructions and teaching finally sink in with a student and their mind is opened to new possibilities. Currie calls it the "aha" moment, and helping students achieve that moment is precisely why the AR sandbox was created. "This is a difficult concept for a student to grasp, and this was a way for me to see that 'a-ha' moment," Currie said. "I think one of the best uses for this tool is to help students flip on that switch, see them get it and that things make sense." As far as Currie knows, Texas Tech is the only university in Texas that has an AR sandbox, though there are a few other non-academic locations in the state, including the children's museum in Lubbock's Science Spectrum. 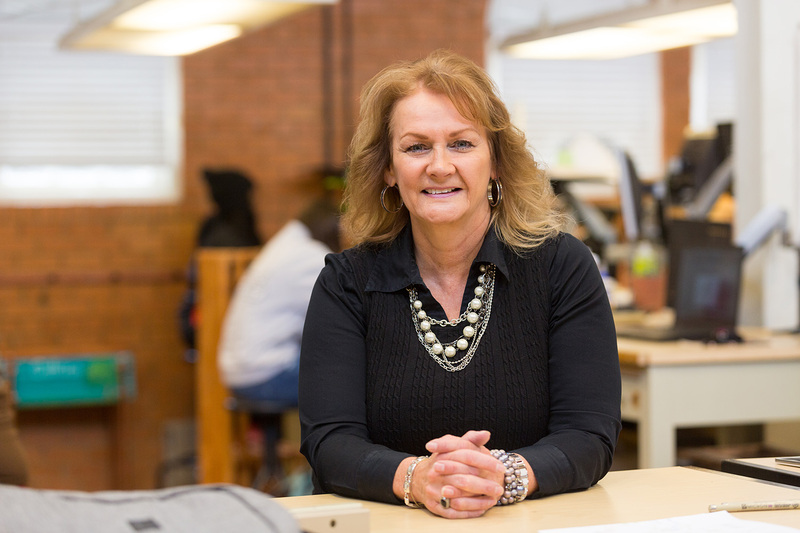 But she is showing the possibilities available to instructors and professors when it comes to site management, and she is hoping to take it beyond the college setting. The AR sandbox made its debut at the First Friday Art Trail in Lubbock this fall, providing attendees with a glimpse not only of what landscape architecture is all about and giving alumni an opportunity to see how the department is growing and progressing through the use of modern technology. "I think this kind of relates to what the Department of Landscape Architecture is trying to do in going to the future with their technology," Palacios said. "This is kind of our first step, and we have more to come and are super excited about it. Landscape architecture is going into a lot less hand-rendering and more into the future with 3-D, AR and virtual reality. I love being here at Texas Tech and being able to use this great facility."